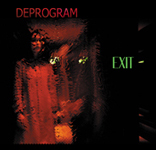 Delivering heavy breaks and soaring analogue sounds, the third Deprogram album, ‘Exit,’ moves fluidly from uptempo, beefy electronica, to ambient moments and back again. Voted album of the week when first released by listeners of FBi Radio, the record contains the popular singles, ‘Sacred Mind’ and ‘Self-Help,’ receiving high rotation on Triple J. The CD is available through MGM Distribution.